I firmly believe that we should play Christmas-themed games during Christmas season, not same dark creepy mysterious games that we play all year around. 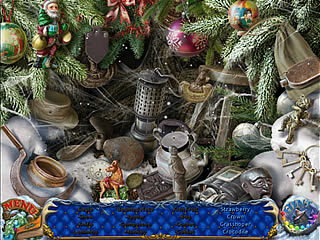 Christmas Tales: Fellina's Journey is one of those games for the hidden object adventure genre fans this year. You are to be part of those heroic stories when you can rescue Santa and the whole world from not having Christmas. One of elves decided to ruin Christmas this year because of his jealousy of Santa's powers. So he just kidnapped Santa. Now you have to find Santa's magic star and stop the gruesome Icy Elf. You will do that by solving interesting riddles, overcoming obstacles, visiting the magic Korvatunturi Mountain, and even traveling by Santa's sleigh. One of the reasons why this game is wonderful is all the scenery and the whole fantasy world. The game play is not real complicated, there are lots of HO scenes that are well done...nothing invisible, and extra HO within the scenes. There are puzzles that range from easy to moderate. The hint system recharges quickly and hints are unlimited. If you are looking for a pretty, relaxing game that is fun to play, and has a decent story line, then Christmas Tales: Fellina's Journey is for you. I loved visiting you all at the Xmas fair! I was so imresespd with you all, I know that you have all been really good this year at school and have worked hard and learnt lots-even the teachers! Ms Davies was a brilliant elf too! I love looking at her praise page to see the boys and girls who have been extra good! 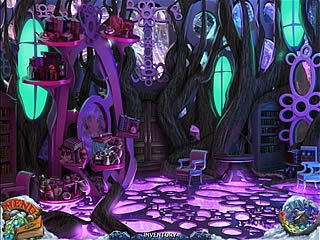 This is Christmas Tales: Fellina's Journey review. Download this game here.